Daily Inspiration - Daily Quotes: Abraham Lincoln: Am I not destroying my enemies when I make friends of them? 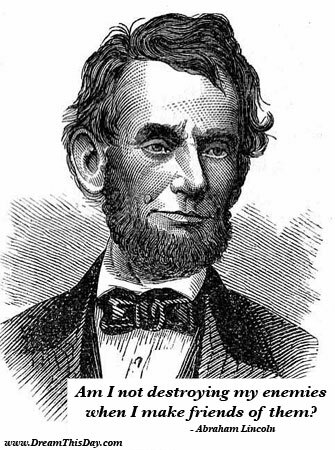 Abraham Lincoln: Am I not destroying my enemies when I make friends of them? Very powerful. I'm thinking of someone right now that I should use this concept on. at opposition for the end result will oppose them.